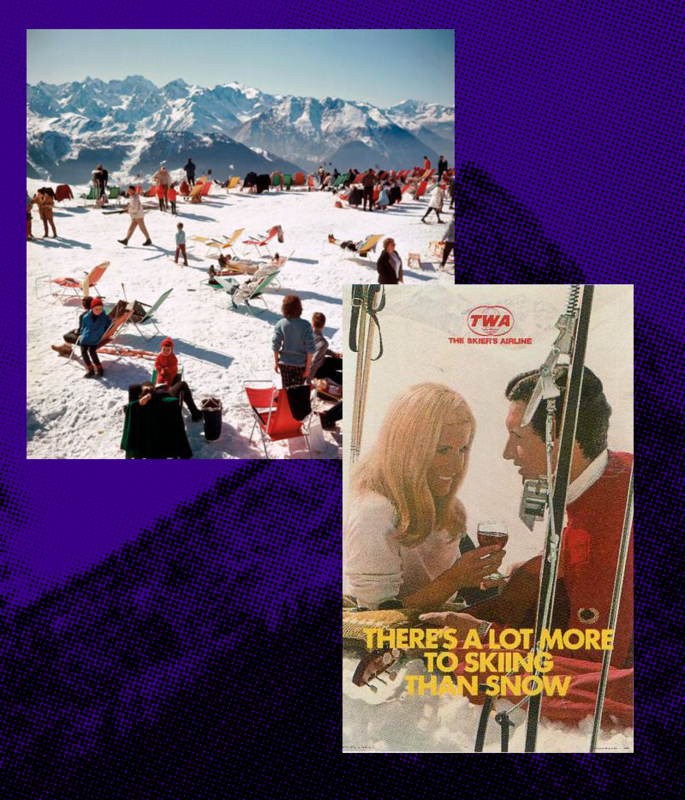 With the ski season well under way the snow literate amongst are schussing down mountains rather than grinding up them. Eschewing casquettes for salopettes and snowploughing their way into bars for schnapps and raclette. 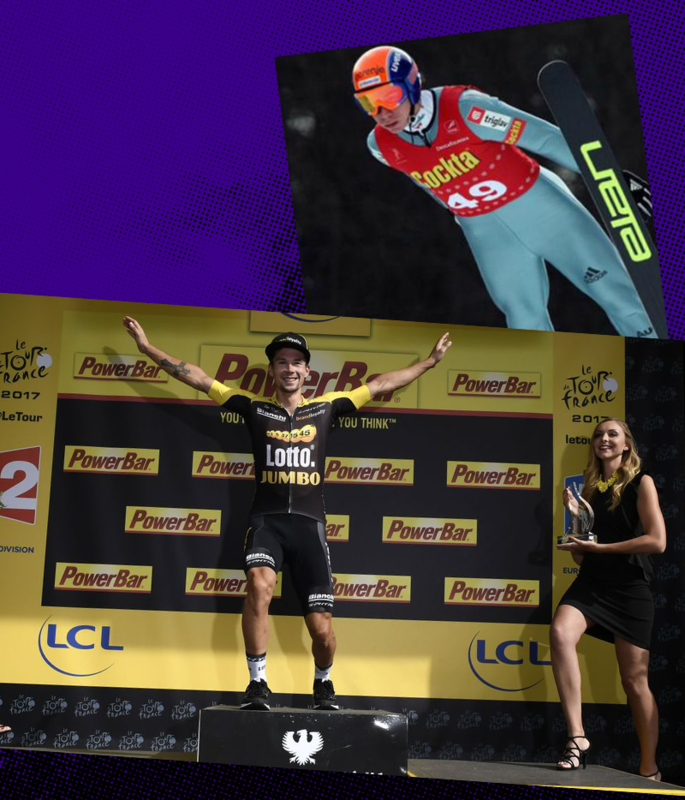 It marks a time when the worlds of cycling and skiing merge in unlikely fashion. Usually we see ski resorts in summer greenery, marking the high points of Grand Tours and summer holidays, but for six weeks every winter steel and carbon is swapped for – well – steel and carbon. But bikes become skis and one set of ridiculous clothing for another. 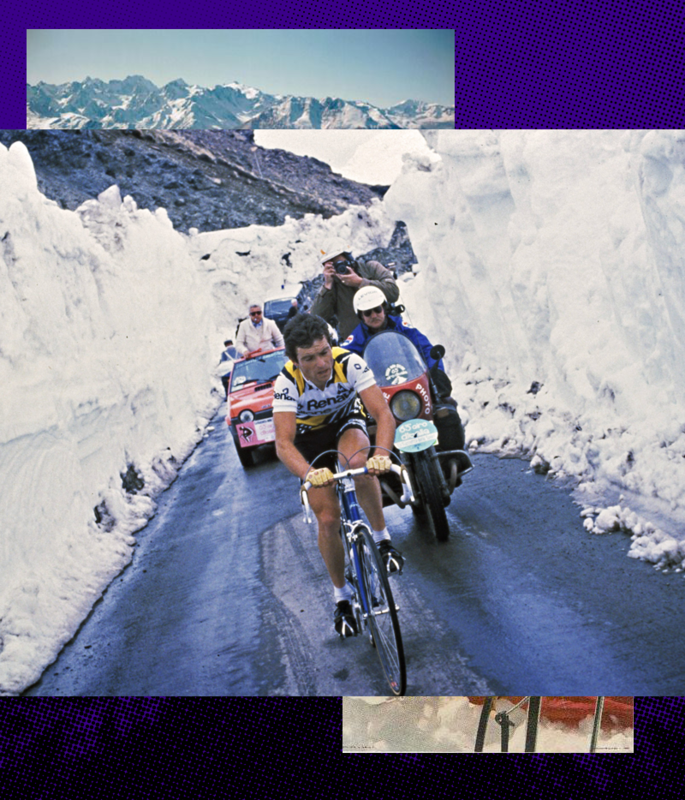 Just what is it with cycling’s love affair with the snow? The weather plays a big part in bike races with those able to overcome severe conditions the most likely to get results. 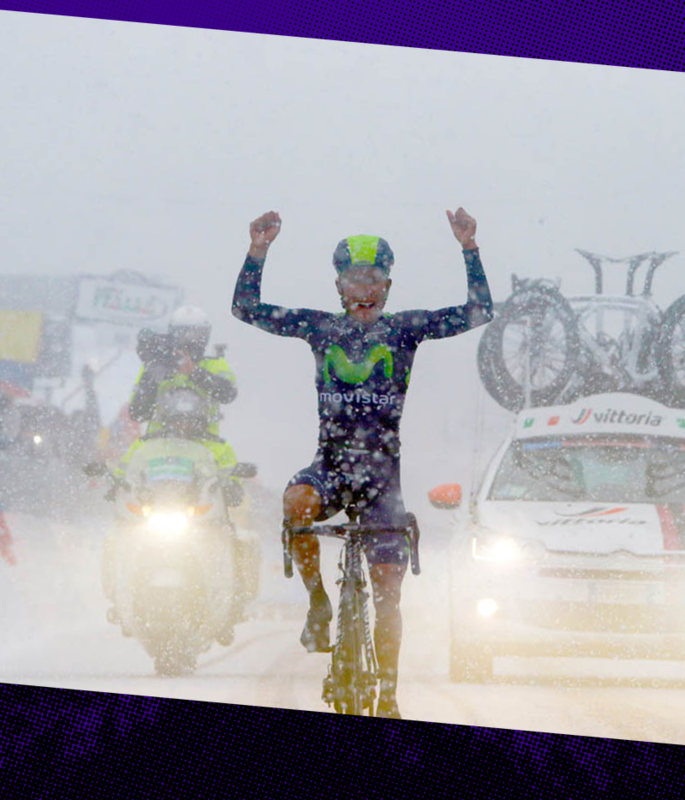 Who can forget Gerald Ciolek’s Milan-Sanremo win in snowbound misery in 2013. The race was paused as riders climbed aboard team buses to transfer around the treacherous mountains. 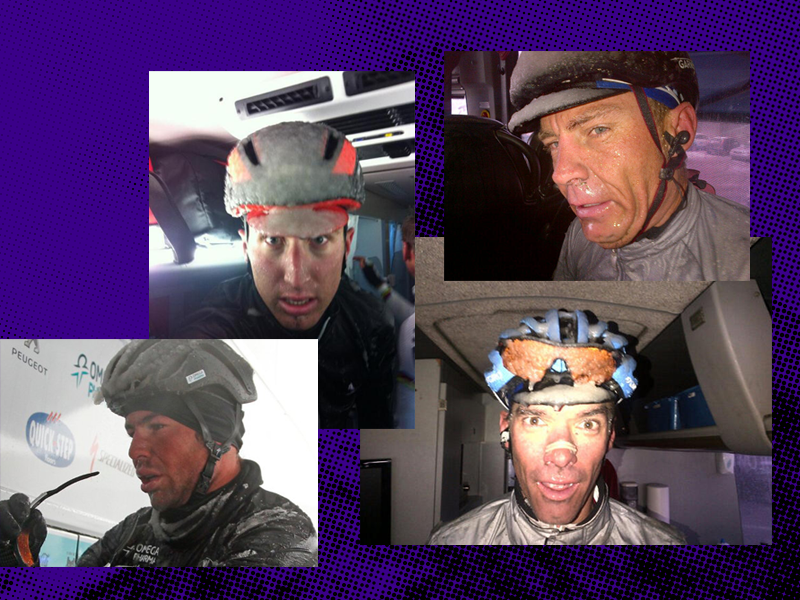 Social media awash with miserable looking selfies from pros in pain and discomfort. 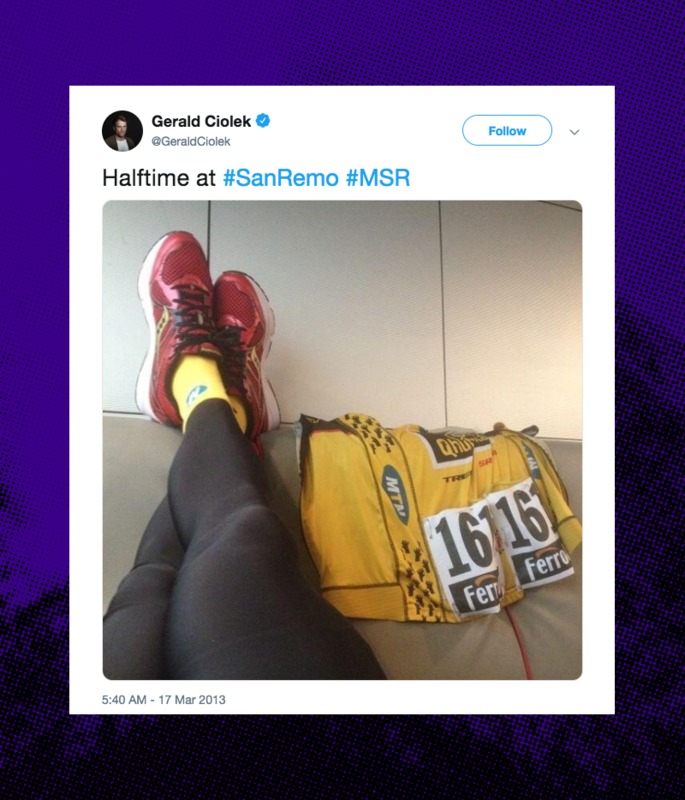 Only the eventual winner was seen to share a smiling portrait from his team bus, relishing his opponents’ weakening resolve before riding to victory as the race resumed. Italy is famed for races with incredible weather to overcome, the Giro d’Italia has seen many a stage cancelled or curtailed to due adverse conditions. In 2014 Nairo Quintana benefitted from the confusion over a neutralisation of the Queen Stage, escaping with Pierre Rolland and claiming to have not heard race radio. Racing up the Stelvio, the highest point of the race, the message came in Italian, French and English that the race was neutralised, apparently unheard by the eventual winner. 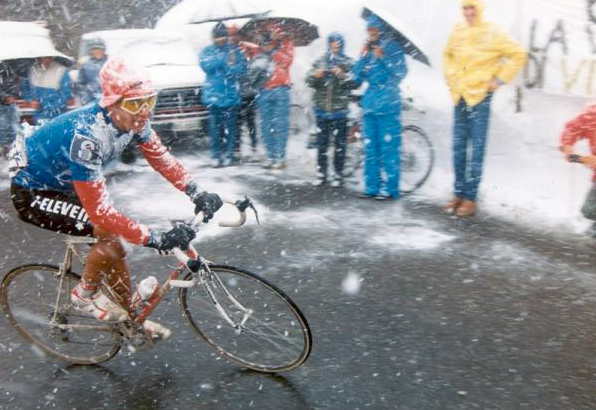 Andy Hampsten’s famous win on the Gavia in 1988 is legendary, the snowstorm photos a part of cycling folklore. His team, 7-Eleven, were well prepared and had visited ski shops to buy up thermals, gloves, balaclavas and ski hats for the team. The Colorado based team clearly well versed in mountain conditions with that ski connection coming in handy. A lift pass directly to a superb stage win. But cycling, like skiing, isn’t all about hardship, pain and the elements. Both sports are a playground for those with elegance, finesse and style to show off. 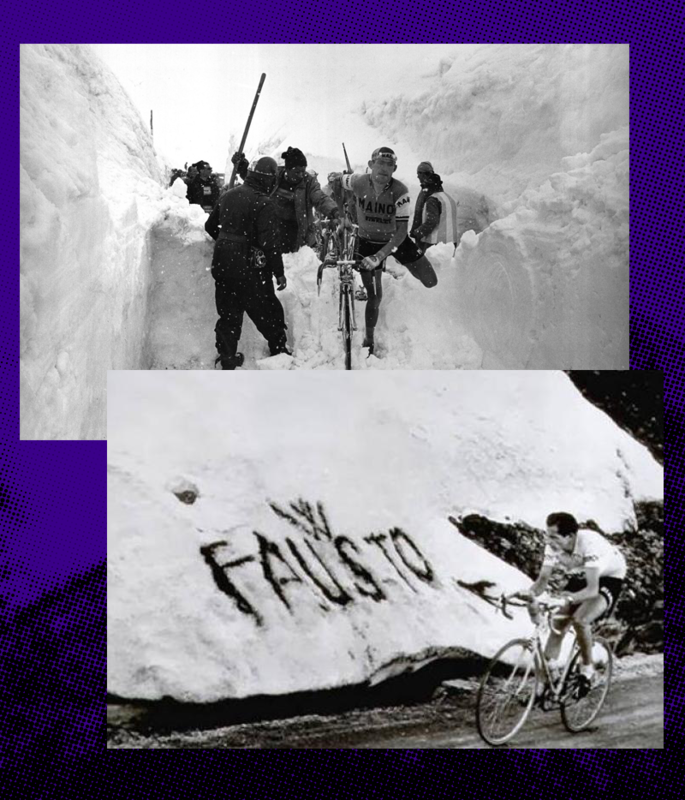 Two of cycling’s most polished exponents could often be seen parading on the slopes. 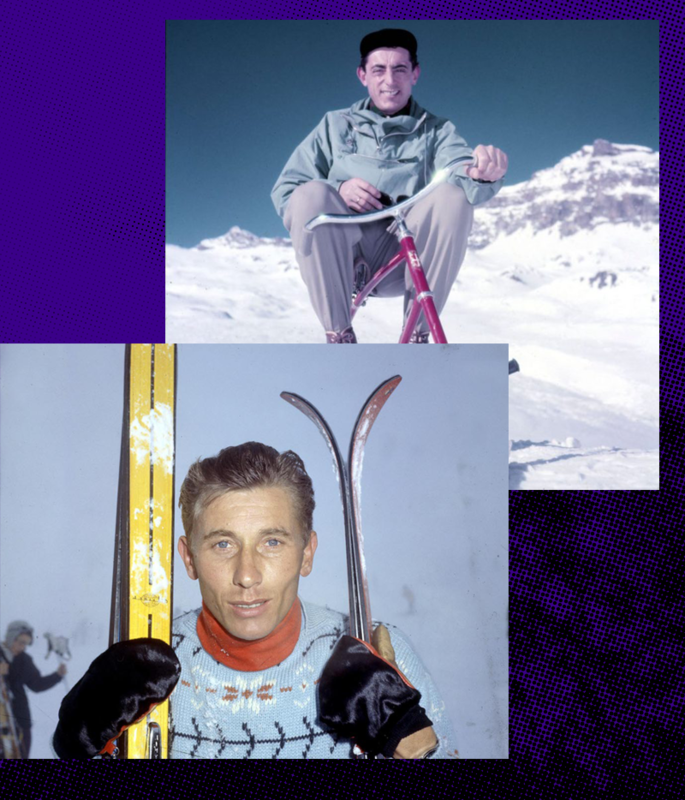 Both Fausto Coppi and Jacques Anquetil looked just as at home on skis as they did on a bike. Countless images can be found of each man looking dashing on mountains in the finest of knitwear and leather gloves, hair glistening in the cold sun. Whether they skiied for pure enjoyment or training is unclear, but the latter is more commonly employed than you might think. 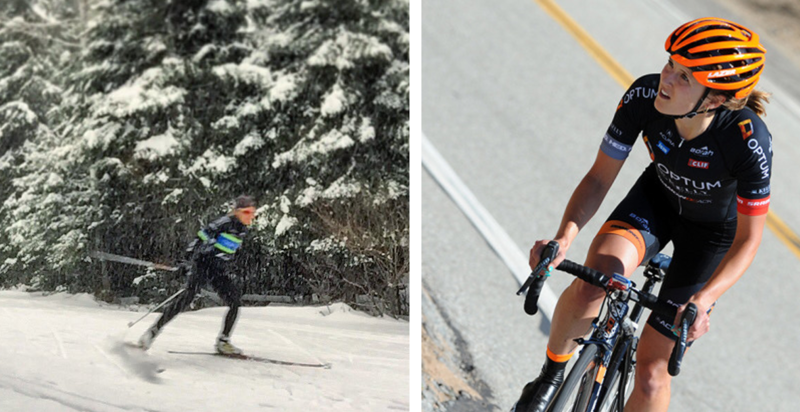 Cross training isn’t something we hear a lot about from cyclists, but plenty of pro athletes do other sports in their off-season to aid their fitness and keep some variety. Variety is something Svein Tuft is expert at, the Canadian time trial specialist is a man of the outdoors, regularly trekking into the Andorran mountains behind his house for weeks at a time. 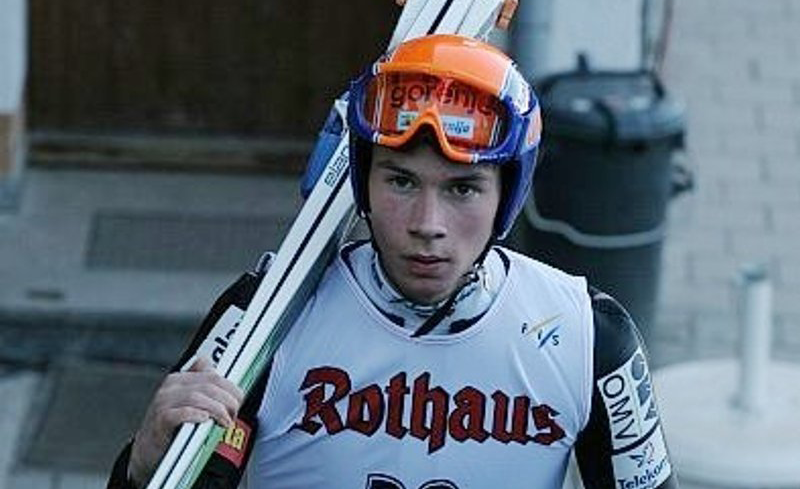 In a trip to Norway in 2014 he added cross-country skiing to his close season regime, not altogether surprising since his grandfather was an Olympic skier for Norway, finishing 6th in the 1936 games. Whilst Tuft is uniquely comfortable with the outdoors he isn’t alone in the pro-peloton when it comes to skiing. Fabian Cancellara and Romain Bardet were both skiers in their youth, with the french climber originally wanting to be a Biathlete. 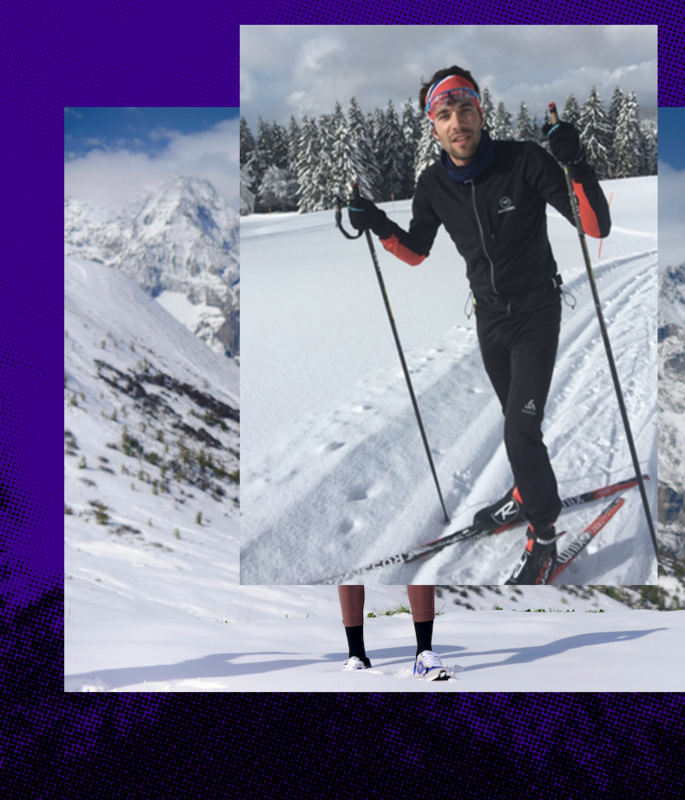 Cross-country skiing is still something he employs for training ‘It goes without saying that it is really good for physical fitness, and the big advantage is the mobilisation of all the muscular chains necessary for good posture on the bike.’ His countryman Thibaut Pinot obviously agrees, competing in the 56km Transjurassienne in 2018 ahead of the racing season. Other current pro’s with a love of the slopes include Canadians Lex Albrecht and Ryan Anderson, the latter has an annual training camp with his Rally team in Colorado. With snowshoeing, fat biking and paintball added to skiing the team certainly embraces the love of snow. 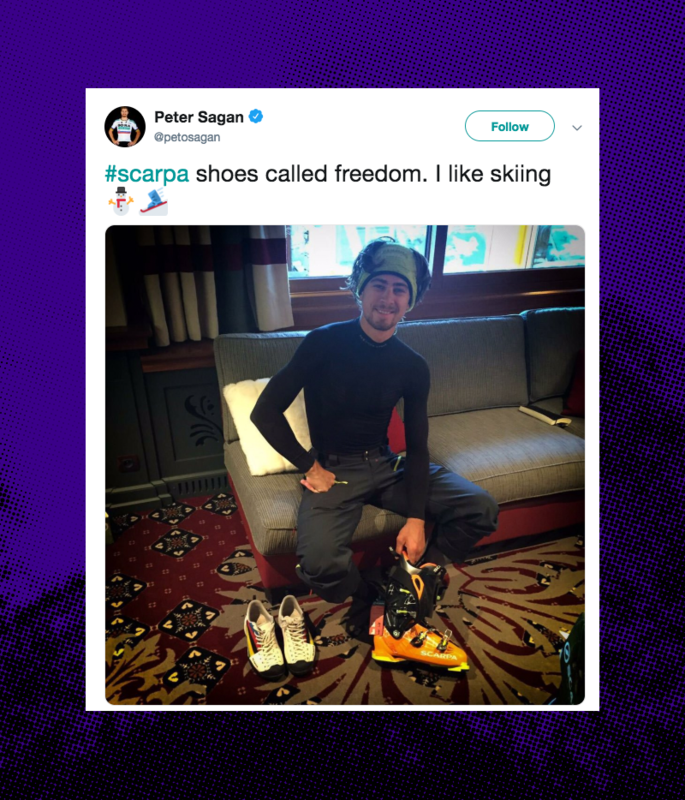 Whilst Canadians seem to dominate this habit, everyone’s favourite king of charisma Peter Sagan perhaps unsurprisingly joins the ranks of the ski fanatics. His recent social media posts a testament to his love of taking the pistes. Of course the most well known skiing cyclist has gone in the other direction – Primož Roglič of Team Jumbo-Visma swapped the ski-jump for the road with impressive ease. It's nice for him that he has a ready made celebration for those awkward podium moments. The ski jump 'landing' must be something no-one else will ever copy. Whether you’re braving the weather at home or sloping off to the slopes our winter range can help keep you toasty this winter. Our bundle deals will set you up for all conditions you’ll face on the bike, whilst our warmers and socks can definitely make skiing more comfortable. Whatever your poison this ski season, make sure you take some time for après-efforts – whether that’s hot chocolate or a drop of the stiff stuff.